Dreamland cinema was was the earliest Art Deco cinema in an expressionist brick idiom, it's design heavily influenced the designs of the later Odeon cinemas. It first opened on 22nd March 1935 with a show featuring 'The Painted Veil'. It closed in November 2007 with the showing of the 1957 film 'The Smallest Show On Earth'. The cinema closed for the war in 1940 with reopening on July 1st 1946. When it first opened, its seating capacity was 2,050 and the unreserved prices were 7d, 9d and 1/- in the stalls and l/6d in the balcony; the reserved prices were l/6d in the stalls and 2/- in the balcony. In 1973 the cinema was sub-divided, and re-opened as two small theatres each seating 350, with a new bingo hall beneath. The cinema has had many owners over the years and was, until its closure in November 2007, operated by Reeltime Cinemas who operate the Carlton cinema in Westgate. During the 1987 hurricane the original Compton organ in the cinema was damaged and never repaired. 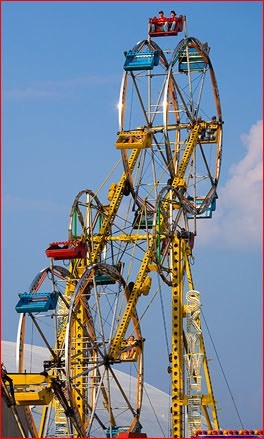 Dreamland's 'Sky Wheels' - Twin ferris wheels. This ride was far more thrilling (scary?) than it's taller single-wheel replacement as the whole structure rotated in an elliptical pattern with each wheel moving independently. The Dreamland site was a salt marsh known as the Mere that was flooded every high tide until 1809 when a road and new seawall were constructed. In 1846 the South Eastern Railway completed a branch from Ramsgate Town sation to a new railway station built on the present site of Arlington Arcade. In 1863 the SER's arch rival The London, Chatham and Dover Railway built a terminus station on the site of what is what to become Dreamland Cinema. However, the LCDR on extending its line to Ramsgate Harbour station built a new through station to the west making the terminus building redundant. Dreamland's origin dates from 1863 when railway catering contractors Spiers and Pond opened a restaurant and dance hall in the unused railway terminus naming it the 'Hall by the Sea'. The venture was not a success and was sold to the Reeve family of Margate in 1870 for £3,750 who also acquired additional low-lying land to the rear of the Hall. The original London Chatham & Dover Railway's Margate West station in 1923 - this building which replaced the unused 'Hall By The Sea' station in 1863 was itself rebuilt in 1926. In 1870 circus owner 'Lord' George Sanger went into partnership with Thomas Dalby Reeve, the then Mayor of Margate to become the co-owner of the Hall by the Sea. After Reeve's death in 1875, Lord Sanger became sole owner of both the Hall and the land immediately behind it. The land, the former 'Mere' was turned into lanscaped gardens with 'ruined abbey', lake, statues and a menagerie, together with sideshows and roundabouts. Zoo cages and gothic style walls on the west and south boundaries, now listed Grade II structures, date from this era. One of the main purposes of the zoo was to act as a breeding and training centre for animals used in Lord Sanger's travelling circus. The first amusement rides were installed in 1880 when 'Sea on Land' machines were installed. Riders would sit in 'boats' that were made to pitch and roll by means of manually operated levers - similar to modern 'flight simulator' rides. In 1893 a large roller-skating rink was built. Shortly after this the park gained some notoriety as the venue for the murder of a prostitute by the local circus strong man. Sanger died in 1911 during a fight arising from the attempted murder of a friend (although Sanger was probably the intended target) and the park entered an uncertain period as part of the attraction was the charisma of Sanger himself. The site was eventually purchased from his estate in 1919 for £40,000 by John Henry Iles who had already created theme parks in Pittsburgh, Cairo, Berlin and Petrograd. Inspired by Coney Island which he had visited in 1906, Iles renamed the park Dreamland and initiated work on the construction of a Scenic Railway roller-coaster in 1919 having purchased the European rights to the Scenic Railway from inventor and patent holder LaMarcus Adna Thompson. The roller-coaster opened to visitors in 1920 with great success, carrying nearly half a million riders in its first year. Iles was quick to install other rides including a smaller coaster called the Whirlwind Racing Coaster, the Joy Wheel, the River Caves, Dreamland Miniature Railway and The Whip. A ballroom was constructed on the site of the roller-skating rink in 1920 and in 1923 Iles built his Variety Cinema on the site. In 1926 Iles undertook the construction of the Cliftonville Lido swimming pool on the seafront. 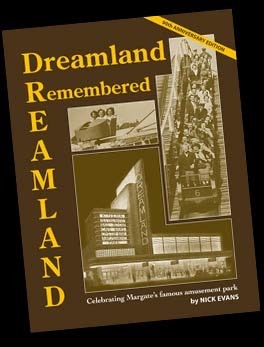 Between 1920 and 1935 he invested more than £500,000 in Dreamland, adding new attractions and facilities and ultimately in the construction of the impressive Dreamland Cinema complex in 1934, now a grade 2 listed building. John Henry Iles retired in 1938 and the business was handed over to his son Eric. During the Second World War much of Dreamland was requisitioned by the Government with the park re-opening in June 1946 - Eric Iles becoming the park's manager. Three generations of the Iles family - John Henry, Eric and John were to control Dreamland from 1919 until its sale in 1968. The new owners, Associated Leisure introduced many innovations to Dreamland, including squash courts and, in an echo of the Sanger era, an ice rink and zoo. Much of the planting of the pleasure gardens dating from the 1870s survived until the 1970s when the gardens were removed and new rides added. Some notable rides to be removed during the 1970's were the Dreamland Minature Railway and the Sky Wheels - a more exciting double wheel version of the classic ferris wheel. 1980 saw the construction of the famous 148 ft high Big Wheel which was to dominate the Margate skyline and feature in much publicity material for the next 20 years. In 1981 Dreamland was purchased by the Bembom Brothers from Holland. They already owned theme parks in western Europe and renamed the site Bembom Brothers White Knuckle Theme Park, bringing in a new headline attraction in the form of the Anton Schwarzkopf designed Looping Star roller coaster. The name change lasted until 1990, when it reverted to Dreamland. Amongst other changes the Bembom brothers were to make include saw the ending of evening opening and charging for admission rather than per ride. They also introduced new high-tech rides that updated the park and made it one of the 1980s top-ten most visited tourist attractions in Britain. In 1996 the Bembom Brithers sold Dreamland to East Kent businessman Jimmy Godden who also operated the Rotunda Amusement Park at Folkestone and Ramsgate's Pleasure Park - the site of the form Ramsagte Harbour railway station. At this time a number of rides were moved to other theme parks. The Looping Star (Great America) went to an amusement park in Budpest with the 360° verticle rotating boat ride The Mary Rose. 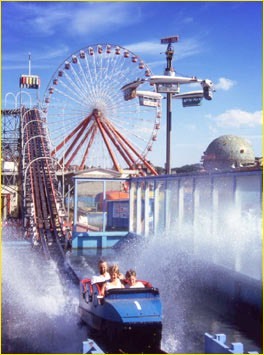 The looping Star's sister ride made a brief appearance for two summers at Margate (Previously at Camelot Theme park). The loop was in the middle of the ride rather than at the beginning. The Looping Star then moved to it's current home 'Loudon Castle Theme Park' where was renamed the Twist 'n' Shout. After his purchase of the park, Godden was able to secure European and regional grant aid to assist in an initial £3.000,000 redevelopment. However during Godden's tenure many of the rides were sold off, including the big wheel which was dismantled and sold to a theme park in Mexico. In 2003, Jimmy Godden announced that Dreamland would close and the land become a retail and commercial site. Public opinion supported continued use of the Dreamland site as an amusement park, along with a government report in 2004. 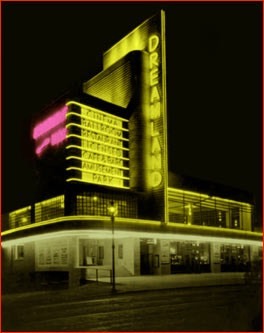 As a result, Dreamland was sold to Margate Town Centre Regeneration Company in 2005 for £20m. A number of local residents have formed the Save Dreamland Campaign. 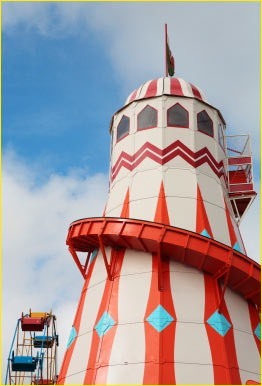 The campaign proposes to turn Dreamland into a Heritage Amusement Park consisting of a number of vintage rides and attractions from other British amusement parks. Some rides have already been obtained by Save Dreamland and are currently in storage. Although it was initially announced that Dreamland would close in November 2003, it did indeed operate during 2004 and 2005. Dreamland was closed to the public in 2005 and all of the rides apart from the Scenic Railway were removed from the site. The Scenic Railway had been granted Grade-II listed status in 2002 and could not be moved or dismantled. Part of the Scenic Railway was destroyed by fire after an arson attack on April 7, 2008. About 25% of the structure, the station and storage sheds were destroyed along with the train car bodies which are believed to be beyond repair. The security of the site was upgraded and the remains assessed for damage. Some of the surviving machinery and underframes from the cars were salvaged and are now stored on site awaiting restoration. 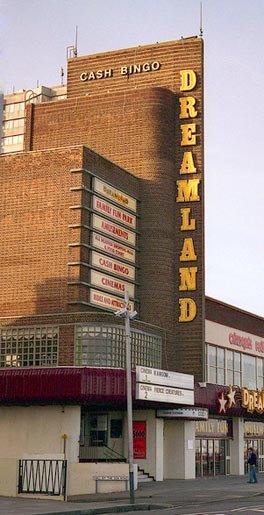 In 2008 Dreamland Cinema had its Listed building status increased to Grade 2 (particularly significant buildings of national interest). The Cinema is not currently open - it was closed due the opening of a new multiplex cinema at Westwood Cross in 2007.